Poached eggs served in fresh cut avocados with a side of bacon and buttered toast. 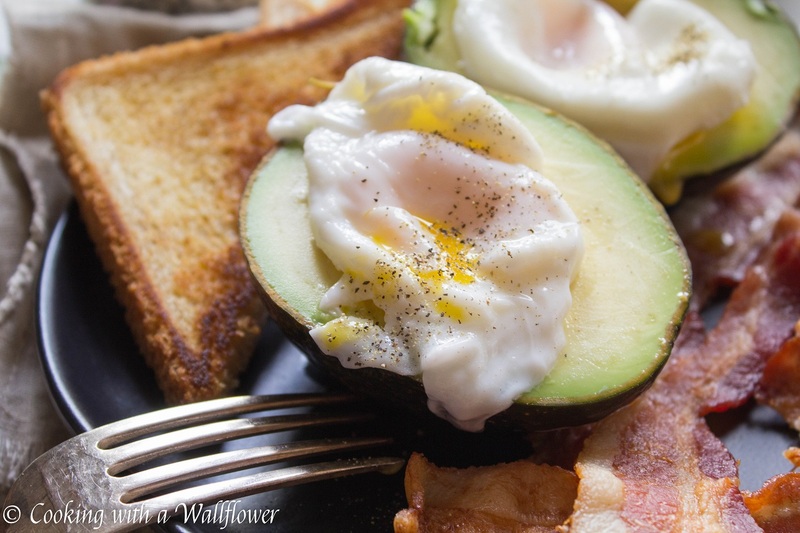 These poached eggs in avocado are super easy to make and perfect for breakfast. 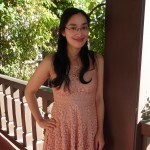 I hope you guys are staying warm and cozy this weekend! We’ve been having dark and gloomy skies with rain here and there and little earthquakes, but nothing compared to what the East Coast is experiencing. With all the crazy weather we’ve been having, I thought we’d keep it a little simple this weekend. 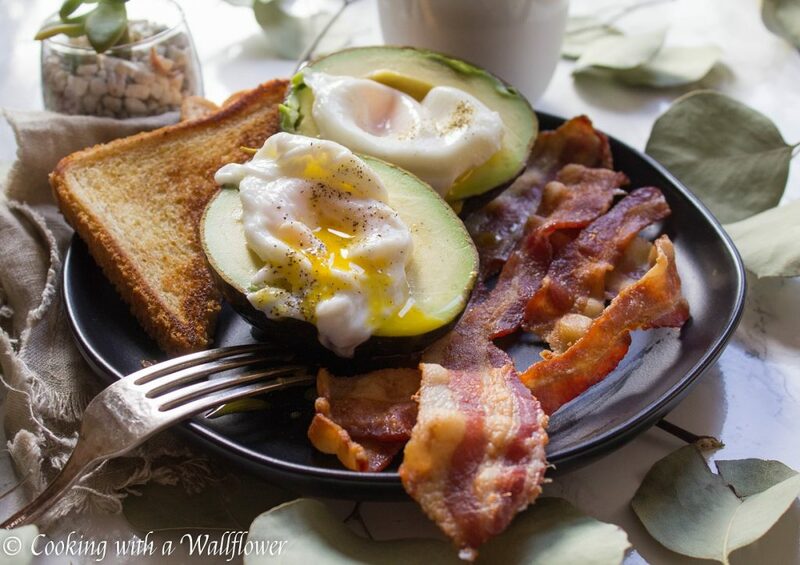 With these poached eggs in avocado served with a side of bacon and buttered toast. I’ve been obsessed with breakfast lately, so you might see more breakfast recipes this January. But let’s start with this simple recipe which just takes minutes to make. 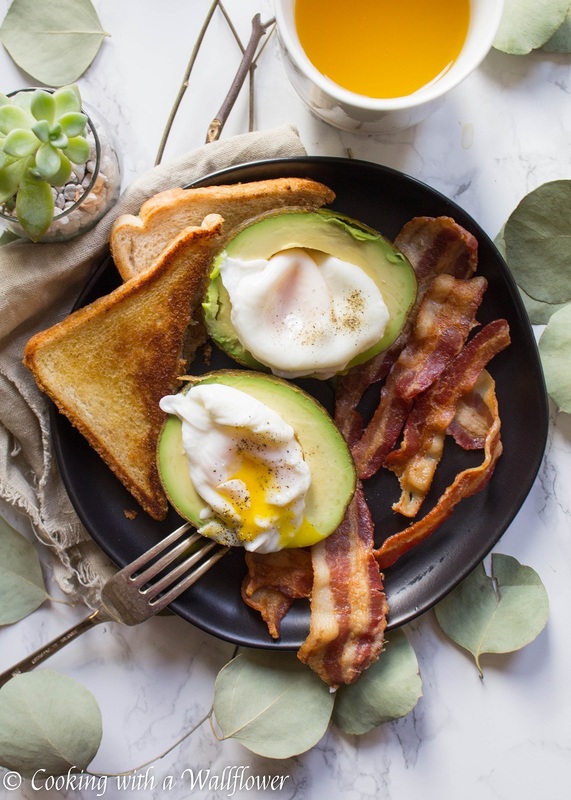 I used to love baked eggs in avocado, but nowadays I prefer my avocados fresh. There’s something about taking a bite of an avocado that’s perfectly ripe that’s just soo delicious. I feel like cooking avocado tastes away that freshness. Which means no baking the eggs. Instead we’re going to poach the eggs for 3-4 minutes, drain the water, and drop it into the center of the avocado. Of course, you can’t have eggs for breakfast without bacon and toast to complete it. I love that every bite has egg yolk oozing over the avocado. That just simple salt and pepper can be the perfect seasoning. And the best part? You can have breakfast served in just minutes, depending on how you cook the bacon. Boil water in a small pot. Once the water starts to boil, lower the heat until the water is simmering. Crack an egg into a small bowl or ramekin, then gently drop it into the water. Do this for each of the eggs. Cook the egg for about 3-4 minutes, then use a slotted spoon to scoop the eggs from the water. 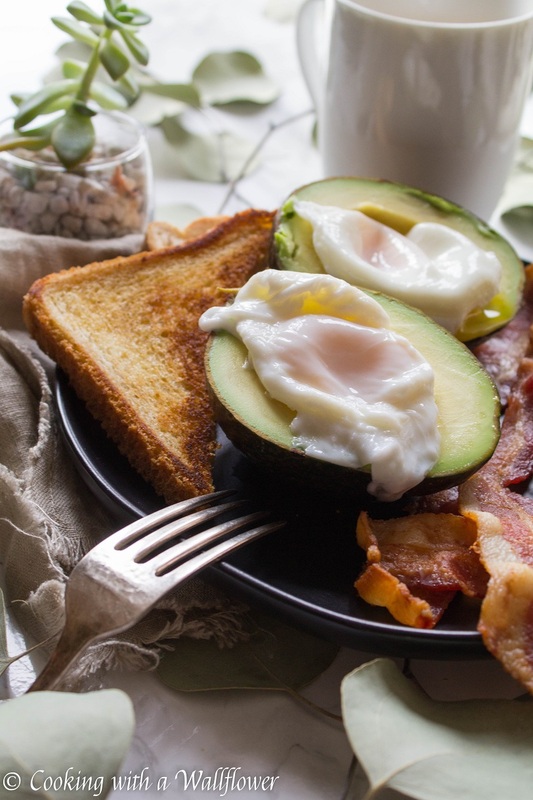 Place the eggs on a paper towel to dry a little before placing the poached eggs in the hollowed part of the avocado. Light season with salt and pepper to taste. To make the bacon, either cook them for a few minutes in a skillet, or if you have time, bake the bacon in the oven on a baking sheet lined with parchment paper for 30 minutes. No splashing, little mess. And for the buttered bread, just heat up salted butter in a pan and toast bread until it’s lightly brown on each side. 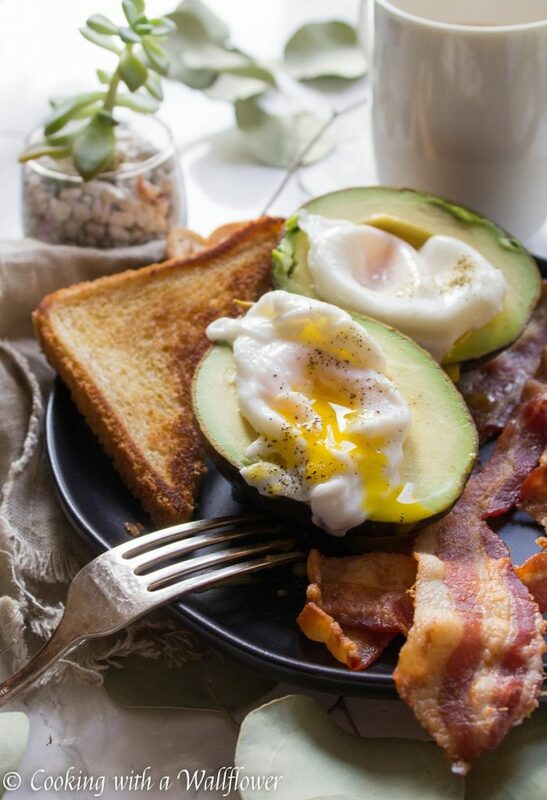 Serve these poached eggs in avocado with bacon and buttered toast warm. P.S. Do you love my new plate? I’m kind of obsessed with the show Fixer Upper so when they came out with a line at Target, I couldn’t resist buying a couple of items. Does anyone else watch the show? Boil water in a small pot. Once the water starts to boil, lower the heat until the water is simmering. 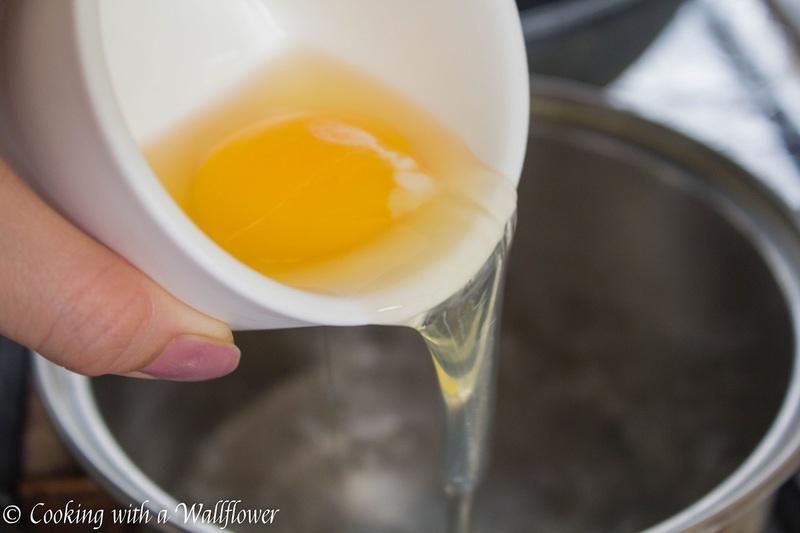 Crack an egg into a small bowl or ramekin, then gently drop it into the water. Do this for each of the eggs. Cook the egg for about 3-4 minutes, then use a slotted spoon to scoop the eggs from the water. 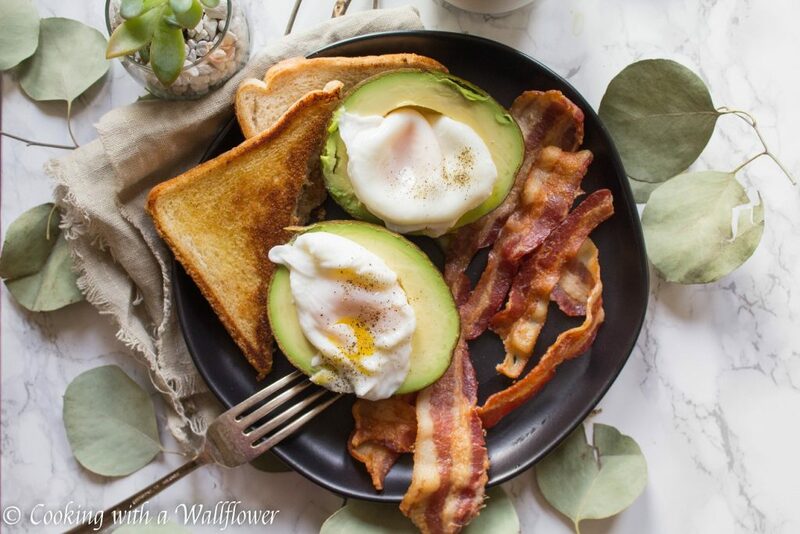 Place the eggs on a paper towel to dry a little before placing the poached eggs in the hollowed part of the avocado. Lightly season with salt and pepper to taste. For the bacon, either cook them for a few minutes in a skillet, or if you have time, bake the bacon in the oven on a baking sheet lined with parchment paper for 30 minutes at 350F. No splashing, little mess. 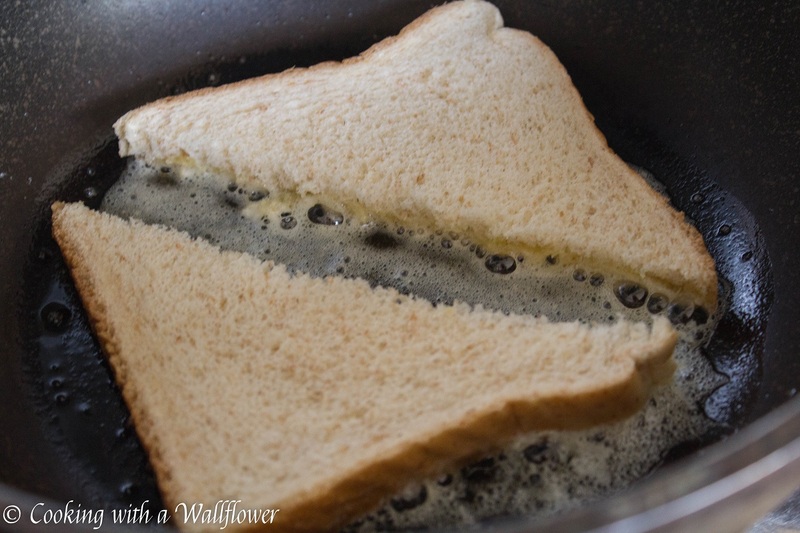 For the buttered toast, heat salted butter in a pan until melted and then toast bread until it’s lightly brown on each side. 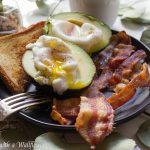 This entry was posted in Breakfast, Entree, Farmer's Market, Quick and Easy, Recipes and tagged avocado, bacon, breakfast, eggs, farmer's market, quick and easy. This sounds and looks amazing! Can’t wait to try it. 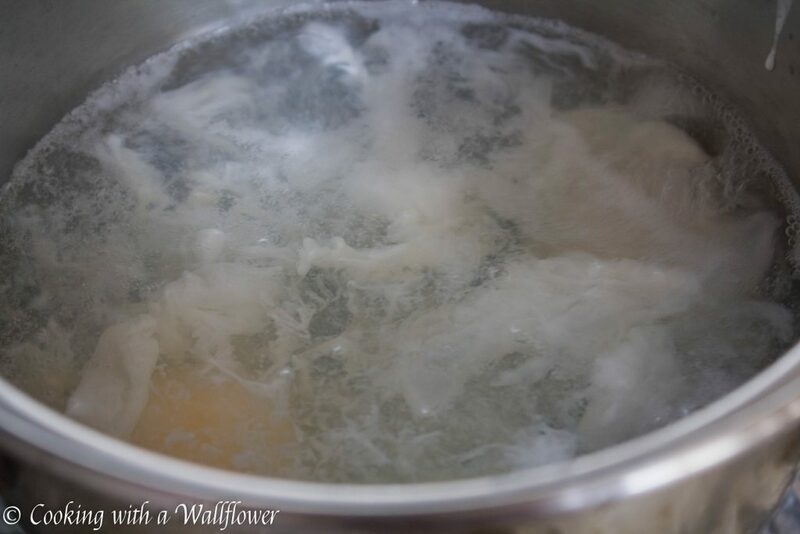 When I was growing up, mother loved to cook her eggs poached. She did the same as ye, on toast, bacon, and buttered. She left me recipes and thats a challenged work I have yet time to put together. She left me her high school 3×5 card copies in a very old wooden box. Included, the minister who married father and her lasted over 50 years. His name was Charile Cook.